Summertime, and the living is easy… especially if you’re a tick. Whether it’s hot and humid or cool and rainy, they’re out there. And they want to be on you and your pets. In fact, they need you to survive. Ticks are like little vampires of the insect world. They need blood to survive as they go through their four stages of life. As long as they have a blood host at each stage, they usually will live the three years to adulthood. Without a host, they won’t make it to the next stage. Besides being a nuisance, ticks can be a health hazard. Their bites can cause discomfort and swelling. In some cases, tick bites can transmit Lyme disease to people and pets if the tick itself is infected with the disease. Avoid their hangouts – Ticks thrive in tall grasses, brush-filled and wooded areas, and leaf litter. That can be anywhere from your backyard to your pet’s favorite field. When in the fields or woods, stick to the center of the trail out of the brush. Dress for success – If you’ll be walking or hiking through tick hangouts, wear the right clothing. Long sleeves and pants offer the best protection. Wear a hat to keep them out of your hair (yes, they hide there too). Wear their least-favorite scent ­– Use tick repellents on bare skin and clothing, but be sure to avoid hands, eyes, and mouth. Spray boots, socks, and clothing directly. Be sure to spray backpacks or other gear, as well. Do not apply insect repellent to your pets. Outfit pets with tick-repellent collars or use monthly tick prevention treatments from your veterinarian. Don’t give them a ride home ­­– Ticks love a free ride into your home. Your pets, children, clothing, even hiking gear can act as a taxi from field to family room. Before going into the house, examine clothing and skin carefully. Especially check children (waist, behind knees, ears and neckline, back, and armpits). At home, showering within two hours of being outdoors can remove any ticks not spotted. Putting clothing in a dryer on a high-heat setting will kill ticks attached to clothes. Don’t panic. 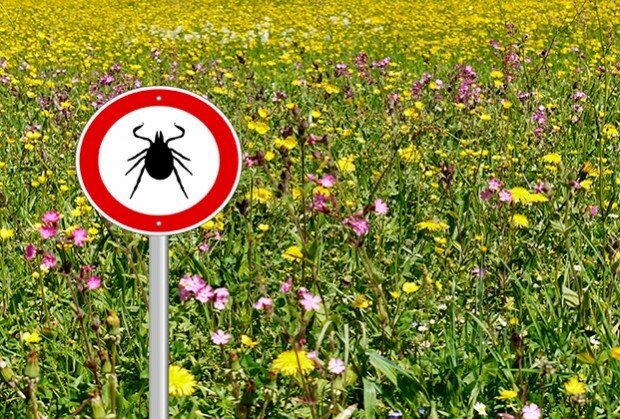 Not all ticks transmit Lyme disease, but it’s important to be vigilant if you live in an area of the country where Lyme disease is prevalent. If you are able to easily remove the tick, wash the affected area immediately with hot water and soap or rubbing alcohol. If the tick is deeply attached to the skin, use fine-tipped tweezers to firmly grasp the body as close to the skin as possible and pull it off in a steady motion (no twisting). Clean the area with rubbing alcohol or hot water and soap. If you’re unsure how to do it, or too uncomfortable to remove the tick yourself, contact your doctor’s office or local urgent-care center for assistance. Don’t twist the tick while removing it. Twisting it could leave parts of it still in your skin. Don’t burn it with a cigarette or other heat. This usually only results in you getting burned. Don’t smother it with nail polish or petroleum jelly. You want to remove the tick as quickly as possible, not wait for it to fall off on its own. If you have symptoms of fever, rash, swelling or other symptoms that didn’t exist before the tick bite, contact your doctor. Symptoms can appear 3 to 28 days after a bite and are often treated with a simple antibiotic if caught early. Remember, ticks are hardy little buggers and can survive through a mild winter. Practice these tips year-round.